are desired along the bondline and bonded components must remain precisely located over their entire lifetime. maximum performance in a system. limitations in acceptable bondline thickness which can be easily cured without creating an excessive amount of shrinkage and inherent stress. 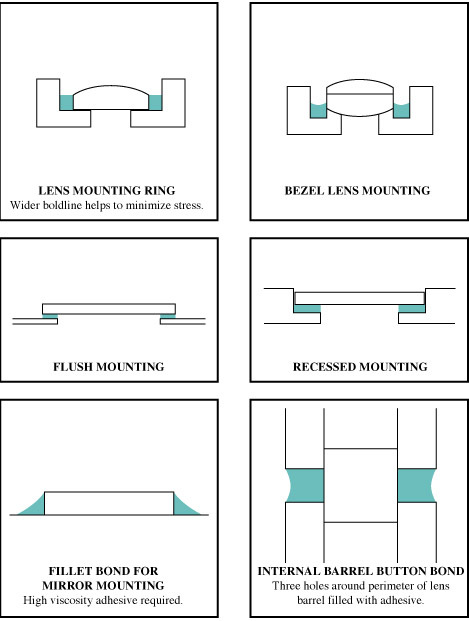 mounting are lenses, prisms, filters, mirrors, as well as fiber optics. engineering plastics now available. Undesirable plastic substrates are unfilled nylon, delrin®, teflon®, polyethylene and polypropylene. optomechanical performance. Among the many properties, the most important are shrinkage, adhesion, modulus of elasticity, and elongation. of decreasing one property to increase another more desirable property. In the end, a balance of properties is typically needed. shrinkage. Fortunately, stress can also be minimized by the cure configuration discussed later in this paper. stretches to eliminate the stressed condition. and do not change as drastically. adhesive can shrink from the surface down which helps to minimize stress. areas unexposed to light, but care must be taken to check for the stresses after cure. change is acceptable but any sudden changes lead to internal stress in the adhesive itself. This will always cause instability over long term. UV curing will be a problem. cycling, shock, and accelerated heat aging will quickly indicate any changes in the adhesive bondline and determine the acceptable products. filters, windows, prism and mirrors. Note how the configurations allow for efficient UV cure. curing adhesives, proper understanding of the capabilities and limitations are needed. exposure and minimize stress during cure. Delrin and Teflon are registered trademarks of Dupont de Nemour.